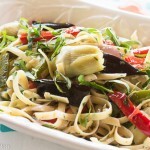 Pasta Salad, Eggplant, Peppers, Artichokes, Roasted Garlic Dressing. It’s unclear from where this recipe ever evolved, but it sure has been a dish with enough happy taste testers to make an occasional repeat performance over a broad range of gatherings for somewhere around thirty years. From potlucks and tailgating, to one of the featured salads served alongside a whole grilled beef tenderloin for Carolyn’s Birthday celebration at our recent bi-annual family reunion down the Jersey shore, this tasty side certainly dishes up a classic combination of enduring flavors with a nice little added twist. Generally, the roasted garlic combined with fresh lemon juice and olive oil dressing is like the secret sauce that provides the not quite so easily distinguished taste and flavor depth that sets it apart from pasta salad with more commonly dressed ingredients. I’ve now prepared this dish twice over the past couple of weeks in order to actually photograph it which even in its simplicity presented a lot of challenge in sharing. The blog challenge has been that in the midst of my usual multi tasking and be-bopping around to household details, I, one morning, moving at my usual top speed, took a nice tumble down the second story steps of my house with an oversized basket of laundry causing a loud cracking sound in my back as I continuously whacked into the wide woodwork lining the banister. It is rather fascinating what goes through ones mind in such an occurrence between screaming while simultaneously thinking ‘I just have to get down the shore to say good bye to my sister Carolyn, and brother in-law Roger before they went back to Vegas, and, I broke my collarbone.’ I didn’t. I was miraculously able to get up even in such a state of shock but was down for the count with Advil’s and a constant heating pad for the remainder of the day. I literally did lay against the heating pad in the passenger seat the very next day going down the shore and while avoiding carrying any beach chairs over the next couple of days, did get to enjoy and see Carolyn and Roger off to a farewell following a very fun two weeks. While this has set me back a bit on the blog, for despite gradually feeling better each day, the back pain and tightness still required a bit too much energy for me to shop and prep and photograph all in a day and produce within the overall timing needed to even coordinate any individual food blog post. Sigh. But I’m not sour lemons for things could have been far worse, and I am very, very grateful it was not. 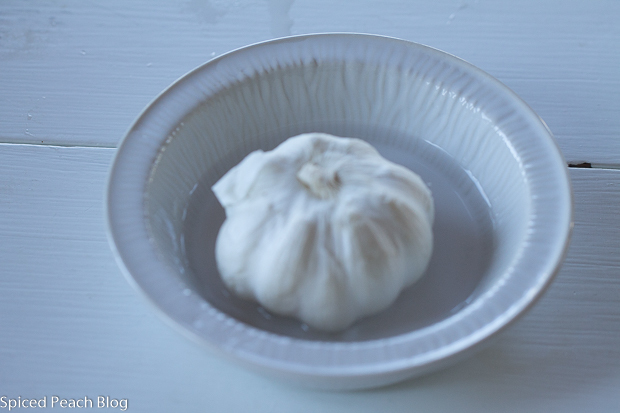 Meanwhile, Spiced Peach Blog’s 4th anniversary then came and went without so much as even a post, let alone some fun peach recipe, and certainly not any peach picking yet. Still there is plenty to celebrate, and another day to prepare a ‘blogiversary’ acknowledgement, so meanwhile from your potluck and gathering of friends, to the tailgate or family reunion, here’s to one enduring Pasta Salad that continues to be much enjoyed by all. Preheat oven to 350 degrees. Line a baking sheet with parchment paper. Cut off both ends of the eggplant, slice lengthwise, then slice pieces in half lengthwise giving you long strips. Toss eggplant strips with 4-6 tablespoons olive oil, a couple pinches coarse kosher salt and a few grinds of black pepper. 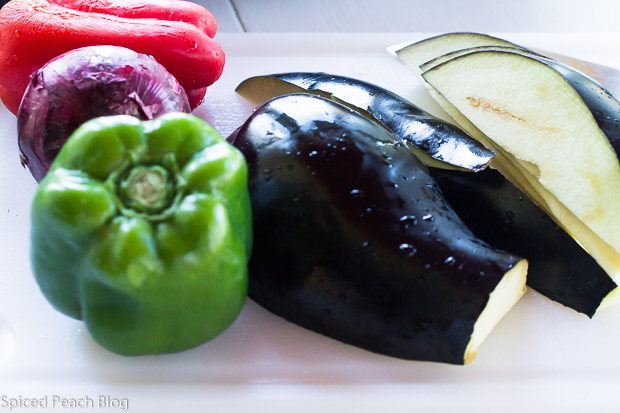 Roast eggplant until golden colored and softened throughout, around 35 minutes or longer. Once eggplant is in the oven, place whole head of garlic into a small bowl close to the size of the garlic, add a bit of water to cover the bottom of the dish, cover with aluminum foil and place into the oven set on a baking sheet, roast until soft, around 30 minutes.Transfer roasted, softened eggplant to a large sized serving dish. Remove covered roasted garlic from oven once done, set aside to cool. Heat a large sized saute pan on medium heat, once hot, add a few tablespoons olive oil then tumble in the peppers and onions, sprinkle with a good pinch coarse kosher salt and a few grinds black pepper, stir vegetables, sauteing until peppers begin to slightly blister and brown in parts, combine with the roasted eggplant. Toss through the seasoned, quartered, artichoke hearts. 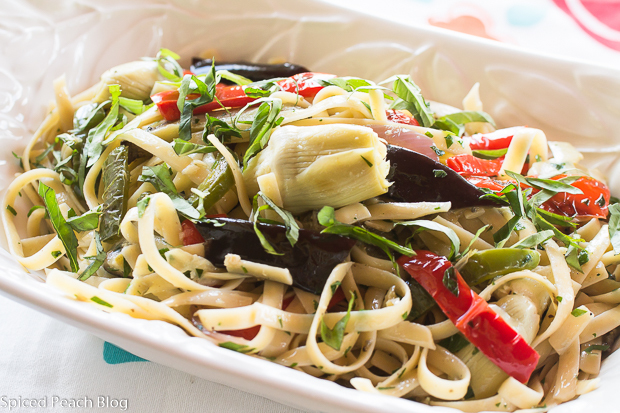 Cook fettuccine in well salted rapidly boiling water until el dente, drain, rinse with cool water, stir through a couple tablespoons olive oil and a couple good pinches kosher salt before blending together with the eggplant, peppers and artichoke mixture. Pour over the Roasted Garlic Dressing stirring throughout the pasta and vegetables, check seasoning, adding more salt and pepper to desired taste. Sprinkle over the parsley and basil, stir well throughout. Serve pasta salad at room temperature. 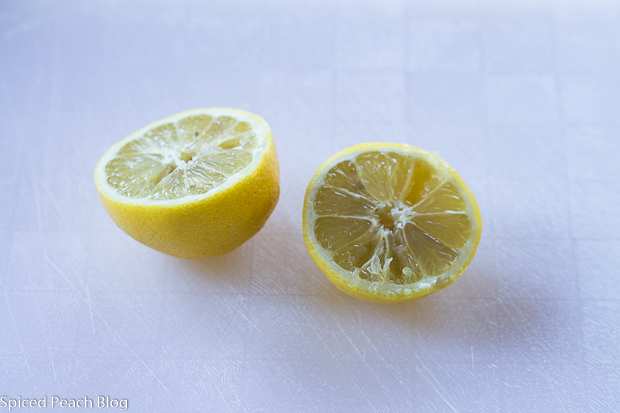 Break roasted garlic in half reserving one half for another use, remove the roasted garlic from its outside paper and place into the bowl of a mini food processor, pulse a few times until smooth then pour in the lemon juice, pulse to combine. Add the olive oil a little at a time in a stream while pulsing the mixture to incorporate and emulsify the dressing, add in a good pinch salt, wiz, check seasoning adding a bit more salt to taste if desired. Using a spatula, scrape dressing from the processor bowl into the pasta salad, reserving a little if serving salad at a later time. Refresh pasta with remaining dressing just before serving along with checking seasoning if additional salt is desired. leftover roasted garlic may be added to soups, stews, sauce, or even spread on sliced, toasted baguettes. This entry was posted in Pasta- Rice-Grains, Salads, TAILGATE / Team Family and tagged Pasta Salad, Pasta Salad Eggplant Peppers Artichokes Roasted Garlic Dressing, Pasta Salad ideal for potlucks tailgating and all sorts of get togethers any time of year. Bookmark the permalink. Post a comment or leave a trackback: Trackback URL. OMG Peg, hope you are OK. You need to chill out woman- always working too hard. Glad you had a good time at the shore with the fam. Pasta Salad looks yummy. See you in a couple. Hi Joanne, thanks much. LOL, yes, I think this was a bit of a reminder to chill out a little and maybe not be constantly moving at top speed. The shore was great and it was so much fun seeing my family! Looking forward to seeing you soon. Thanks on the Pasta Salad. Big Hugs to you!!! Hi Peg. I agree with Joanne. Rest up. Pasta looks beautiful, love the artichoke. Take care. Hi Meredith. Thanks so much. I’ve no choice but to move at a bit of slower speed in the moment but Thank God nothing worse happened! Looking forward to seeing you! Big Hugs. Happy Blog Bday Peggy, glad that you are okay. Take care of yourself, my goodness that could of been worse. Thank you so much Cheri! Too bad I didn’t get to celebrate as I would have liked but at least I’m recovered now and that is a celebration in itself. Love your summer garden, your posts and your new blog design, you kept me enjoying lots of happy reading over the past couple of weeks! See you soon. Ugh! Feel better, Peggy! Take it easy and rest up. Happy Anniversary to you on 4 years of Spiced Peach. I can’t wait to see what the next four years unfold. That salad is divine…such a great flavor combination. You had me at roasted. Kelly recently posted…Happy Birthday, Mom! Hi Kelly, So happy to hear from you and I’ve been thinking of you daily wondering on what you might be doing on your Spain and Portugal trip that day. Nice to see some pics through Instagram too. I know on the fall, ugh. I’m feeling much recovered as I finally respond back on comments- and I’ve more to catch up on as well. Thanks on my 4 year Blogiversary! Hopefully at some near juncture I’ll have the opportunity to put in the necessary components to finally surge forward. Thanks on the Salad. Have lots of fun in your remaining weeks! Big Hugs and Love your way! Sigh. I’m a little chagrined. Ten day’s after your spill and I am just actually getting to your real blog and not the little bit I see on Facebook. I am so, so sorry for your rather dangerous fall, Peggy. But, am really, really happy that Advil, a heating pad and a little rest is what is needed to recuperate. Tuesday when I was ushering at an Aspen Institute event, I spotted an old friend and summer Aspenite. She had fallen off her bike, broken her collarbone and really has had a slow recovery period. So, thank goodness. “You must fall well,”. (A doctor told me that once after taking a really, really bad fall in the mountains without breaking or smashing any part of my body but my ego.) This Pasta Salad looks like a very special dish that would be a terrific luncheon main course. Many of my friends are vegetarians and this fits very well. Get better and maybe someone upstairs is reminding you to slow down a bit. Just a thought. I know. I know. Pot Kettle Black. Hi Mary, I’ve just happened to see your comment and thought I had replied, likely because we were emailing each other. Thanks much. Now I cannot locate it on the comments profile. Sorry about your friend and I do hope she progresses as quickly as possible in her recovery! This would be an excellent dish for the vegetarian crowd with a nice veg selection and good flavor. Thanks so much Mary, and I am certain I already did respond both by email and in another comment that someone upstairs was reminding me to slow down just a bit, I did get the message! Talk to you soon!